90 lenses per box @ $51.80 per box. Minimum order 2 boxes (three months' supply). 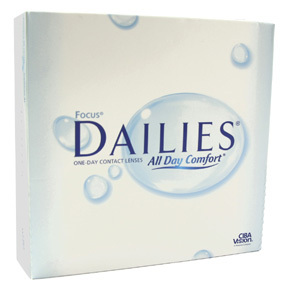 One of the original breakthrough trio of daily disposables, the Focus Dailies lens was recently given an upgrade with the inclusion of Ciba's "AquaComfort" moisture system: this ensures each lens retains it comfort throughout the day by releasing moisturiser into the eye each of the 10,000 times a day the average lens wearer blinks, thereby avoiding the dryness and discomfort sometimes associated with older lens types. This is now Europe's best-selling lens.